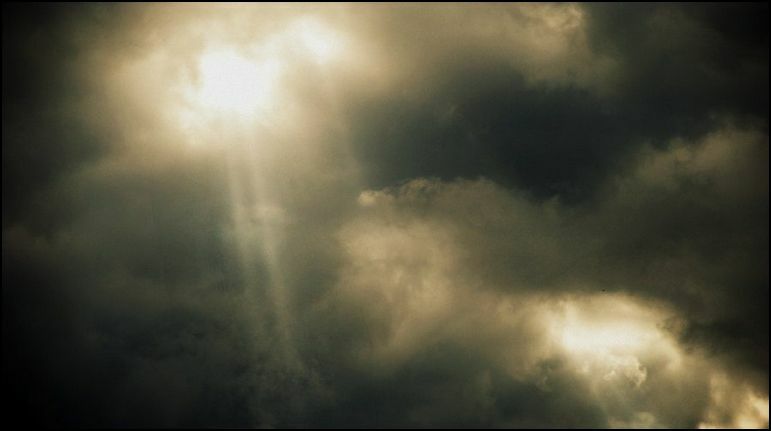 God’s Word declares that Satan comes as an angel of light, so is it any wonder that so many are being deceived by popular mystical teachings that are being presented to Christians these days claiming to draw them closer to God and to experience Him on this side of heaven? After all, those of us who are Christians long for the day when we will see Him face to face, so why not experience being in His presence and hearing Him speak to us now? If you have been led to believe that by listening to someone’s teaching, it is unbiblical and dangerous! When we begin to seek after having experiences with God and lose sight of the fact that God gave us His Word so that we might come to know Him, and how His Word warns us time and time again about false teachers and doctrines of demons, then we allow ourselves to become easily deceived by the many so-called Christian leaders who are promoting mysticism these days. Things such as Contemplative Prayer, Spiritual Formation, and silent prayer, are strongly being promoted by Christian leaders such as Rick Warren, Beth Moore, Tim Keller, Mindy Caliguire, and many others. They may attempt to cloak these practices with somewhat Christian terminology, but don’t be fooled; they are still unbiblical eastern practices that have their roots in Buddhism and Hinduism and will lead you away from Biblical Christianity and into spiritual deception and the occult. Praying for spiritual discernment, knowing God’s Word well, testing things in light of Scripture, and searching for information on things that are presented to you that cause you to have uneasy feelings, are key to protecting yourself from being deceived spiritually. I highly recommend Lighthouse Trails, Herescope, Deception In The Church, as well as Apprising Ministries, but I still urge you to continue to test everything you read and listen to against the truth of God’s Word since, sadly, so many Christians are drifting from Biblical truth these days! 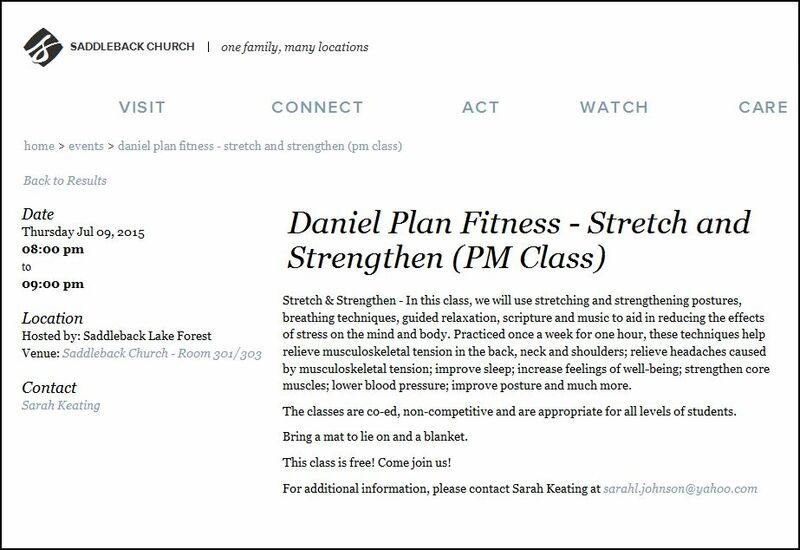 Even though I cannot say with certainty that the term “strengthening postures“ that they use in the following description of this ‘Stretch and Strengthen’ class is actually yoga, that term certainly sent up a big red flag and set off alarm bells in my spirit! 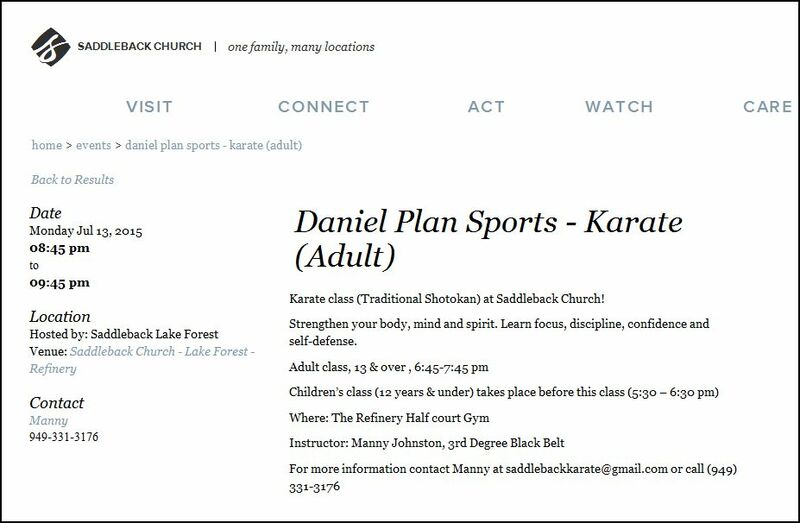 I realize that some Christians enroll their children in Karate classes, and I may be stepping on some toes by using this Karate class as an example, but there is much more to Karate than just learning how to defend yourself and learning how to become more disciplined. When my brother enrolled in a Karate class they told everyone in his class to bring in a candle so that they could focus their attention on the flame, which is a New Age meditation technique. If you’d like to read the detailed testimony of what caused a woman to walk away from a championship career in the Martial Arts, please click HERE. UPDATE: Because of a suggestion that was expressed in a comment from a helpful and thoughtful reader of this blog encouraging me on in my continued search for answers, I decided to set aside my main focus of searching for more information on Leonard Sweet. 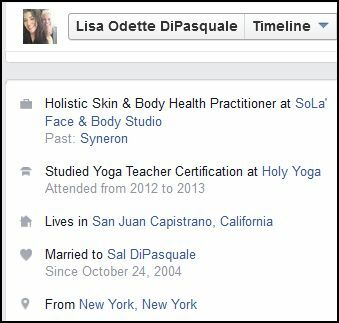 Instead, I decided to first search Facebook and Twitter to see if Lisa Odette, (the instructor of one of the Stretch and Strengthen classes) was on there. 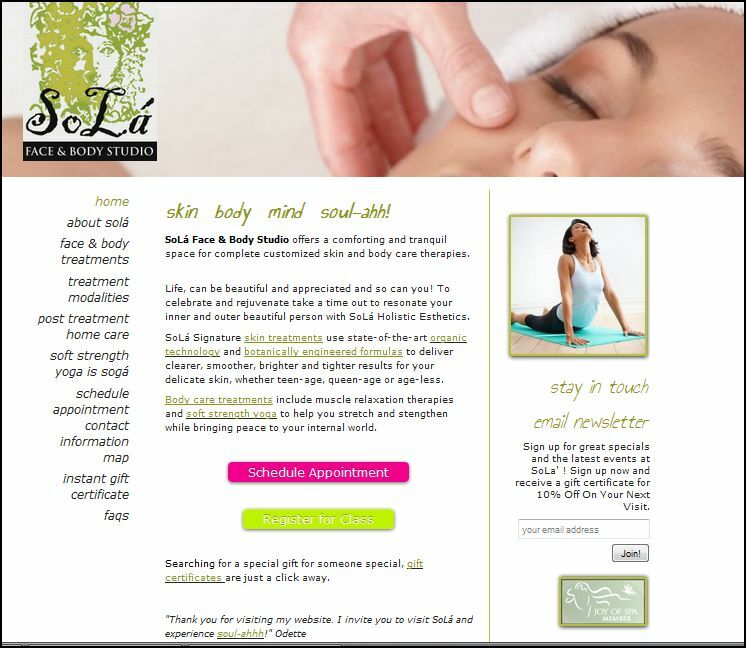 One thing led to another, and here is the information that I found on her that definitely gives enough evidence to clearly indicate and to now say with certainty that the classes offered by Saddleback with Lisa Odette as the instructor, are indeed Yoga classes, no matter how they may try to disguise the language! Now I’d like to share some examples with you of how people are failing to test things in light of Scripture and therefore end up getting involved with those who are heavily into spiritual mysticism and unbiblical teachings. This is not meant to be an attack on the character of the people whom I will be speaking about, and I am not judging anyone in regards to their salvation. I am simply sharing this information with you just to, once again, point out the extreme importance for us to always test things that others say and do in light of Scripture, and how we should never promote anyone or anything without first deeply looking into their beliefs. Also, I wanted to use this as an example to show why we are never to take anyone’s word on a matter or an endorsement of someone; we must always think for ourselves and do our own research to see if a person’s teaching lines up with God’s Word. 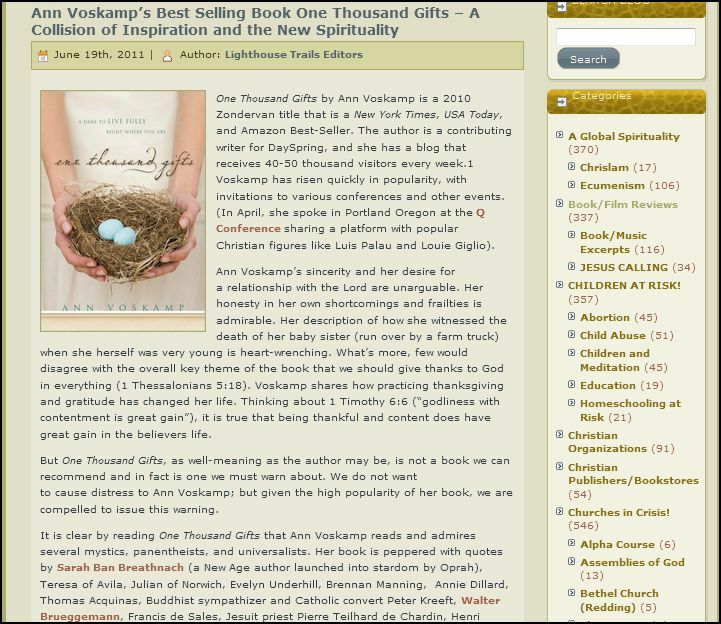 If you have never heard of Ann Voscamp before, she is the author of the best selling Christian book, ‘One Thousand Gifts.’ In case you are not aware of the concerns that many Christians have with her book, I encourage you to continue reading the article below that I quick captured in part for you from Lighthouse Trails Research. If you decide to continue reading it, you will soon come to realize that she promotes unbiblical mysticism, as well as intimacy with God that is far from being Biblical. 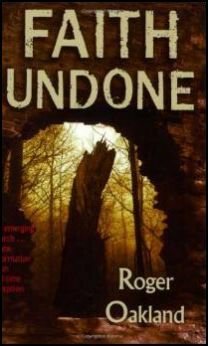 (For those of you who have requested that I post book reviews, you can consider this the first one). 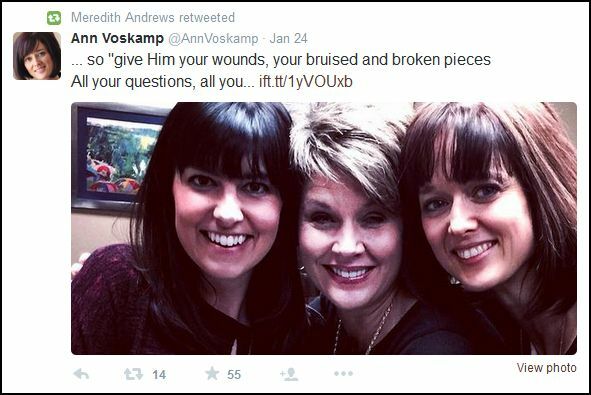 A bond seems to be developing between Meredith and Ann V. because of the conferences they have been involved in together, so, in her enthusiasm and support of Ann V., Meredith retweets many of her tweets, thus endorsing Ann Voscamp in the eyes of the many who follow Meredith and love her beautiful, powerful voice that sings out praises to our God. But sometimes friendship has a way of blinding us to error, and can be deadly to us and to the many we influence in our lives. 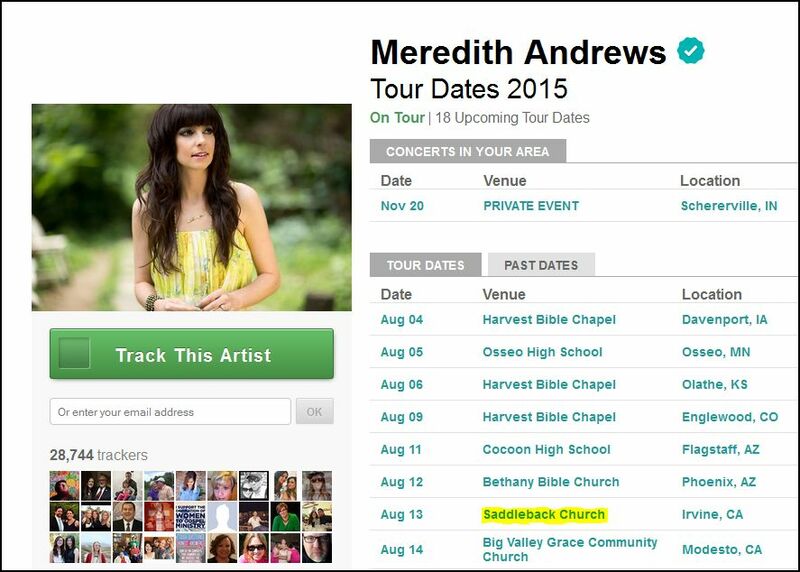 I would rather believe that Meredith is not aware of the unbiblical nature of Ann V.’s book, than to believe that she has read it and is in complete agreement with everything that’s in her book. What these people unknowingly were presented with, was a mystical, new age form of prayer, as well as new age Reiki energy healing. 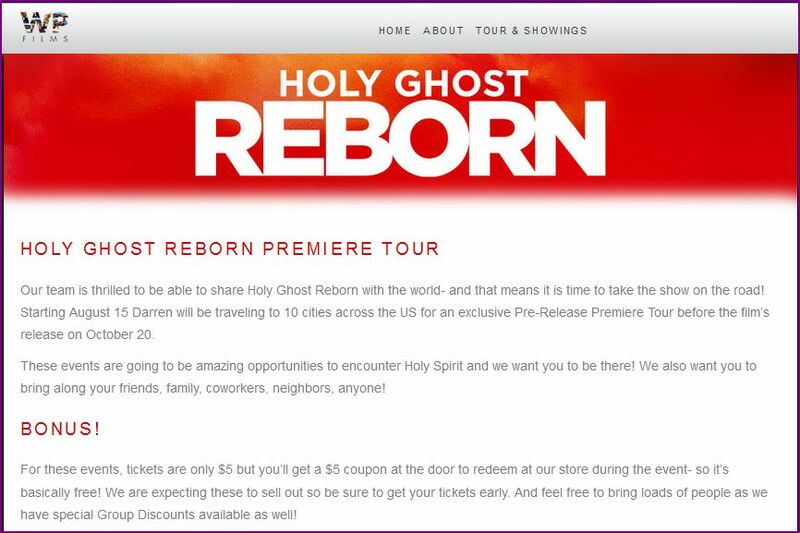 The focus was on experiencing the “Holy Spirit,” but what they actually experienced were unbiblical occultic manifestations, as you will soon see and hear in these reviews. 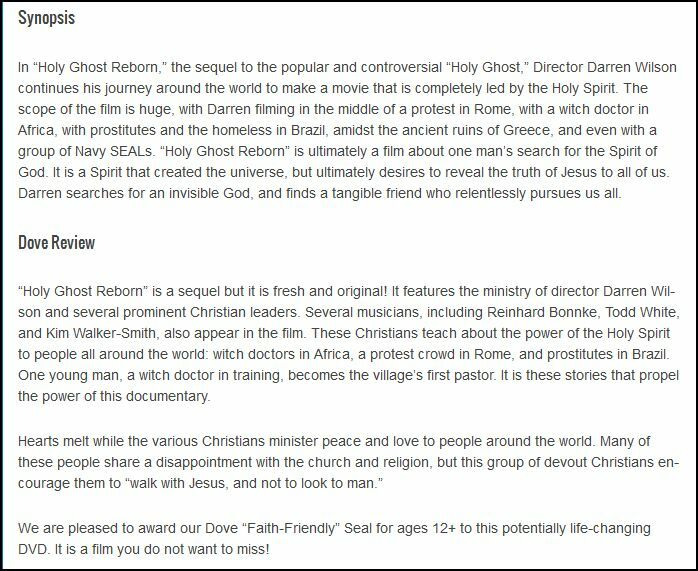 This is why it’s so very important for all of us as Christians to do our own research and never take anyone’s recommendation on what to see or read, etc. First we must always test the teachings of everyone in light of Scripture (Acts 17:11) so that we will not be deceived. 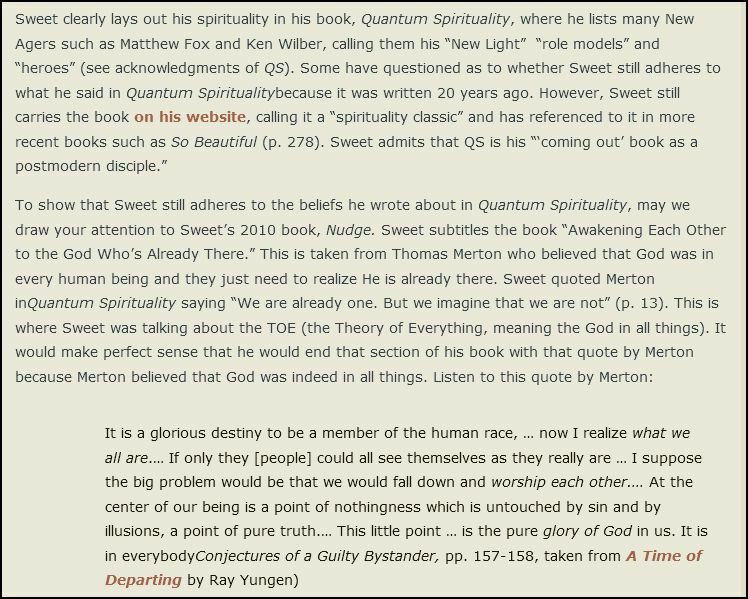 Once again, I am hoping that Meredith just doesn’t have any idea what Leonard Sweet’s beliefs are, which is why it is so very important for us as Christians to do research on those we are considering getting involved with or getting our teachings from so that we will not be led astray, and so that we will not cause anyone else to be led astray by who we choose to get involved with, and what or who we promote. 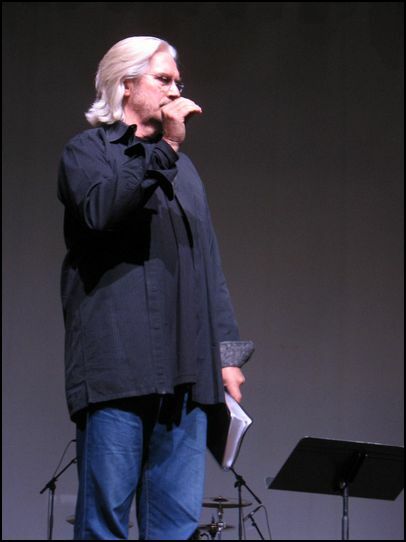 “And we also have to understand that Jesus died…the redemption story is a story of redemption for all creation. Remember that, that covenant that God made with Noah?It was made with all creation. And that, that continues the redemption of that covenant, and the fulfillment of that covenant that takes place at Calvary is a redemption for all creation.” (Emphasis in red is mine). “Jesus didn’t just die to save souls; He died to save seals, as well as souls.” (Emphasis in red is mine). However, if you come to understand all the teachings of Leonard Sweet, (as well as Brian McLaren, as you will see by the information below) you will realize he means much more than that. “Praise be to God, for God’s unspeakable gifts. And the greatest gift, besides Jesus, this gift of the creation, that Jesus came to save. Len Sweet, here.” (SOURCE) (Emphasis in red is mine). When time allows, please watch the videos that I posted for you below by Christian author and speaker, Warren B Smith who was once deeply involved in the New Age Movement, but now he speaks and writes on the subject to warn Christians of the many ways that these New Age teachings are now permeating many churches today. 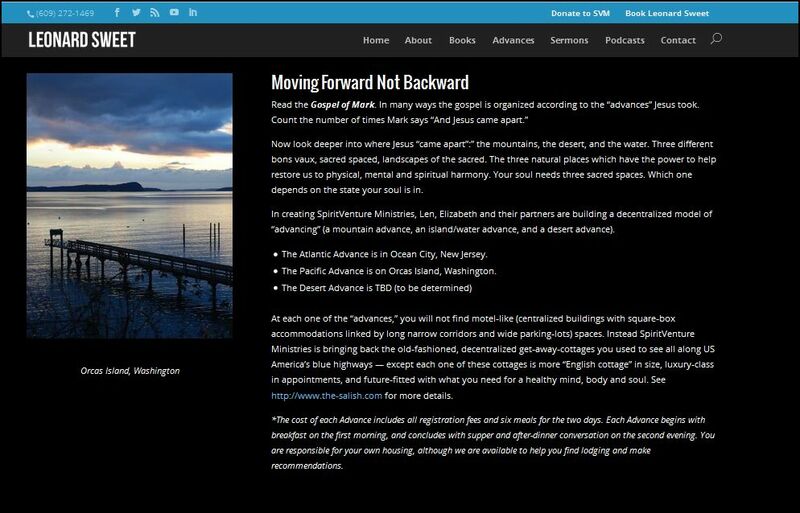 He also shares information on these new age concepts, as well as information on Leonard Sweet, Rick Warren, and many others in his presentation. 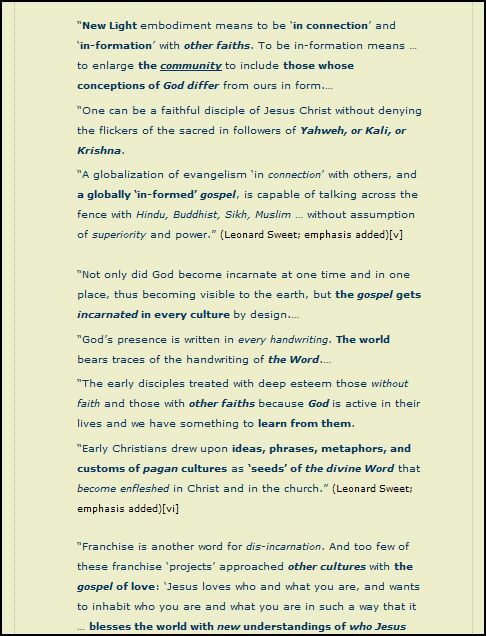 How is it that Christians are unaware of the New Age teachings of Leonard Sweet and some other prominent Christian leaders and writers of today? 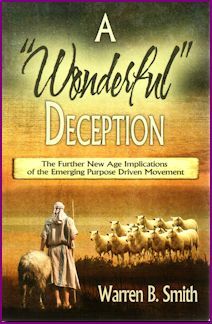 Is it possible that since some Christians today lack spiritual discernment because they fail to test the teachings of popular Christian teachers in light of Scripture and that they are also unaware of what the teachings of the New Age Movement are, that they have simply blended these New Age teachings into Christianity without realizing it and have embraced unity in a way that Jesus never intended for us as Christians to do? The term “sacred spaces” leaped out at me, because I learned many years ago that the word sacred is used quite frequently when ‘Contemplative Prayer‘ is involved. But in my determination to try and finish this post I simply ‘quick captured‘ the above information and ended up completely missing what I would have seen if I had only taken one more minute to scroll down just a little further! When I saw some of the replies to Pulpit and Pen’s tweet, I went back to that page, and this is what I realized what they were all wondering about –and rightly so!! 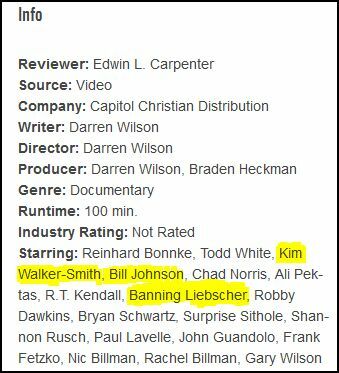 Seeing the name Brian McLaren on that list was a huge red flag! (In a minute I’ll explain why, for those of you who aren’t aware of who he is). 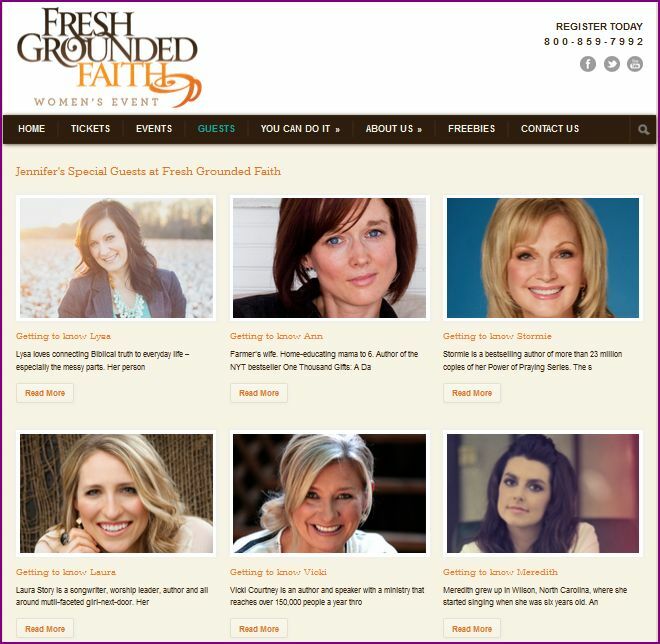 So was seeing Erwin McManus, Mark Batterson, and…Mark Driscoll! The only other person on that list that I was aware of is Margaret Feinberg. She is often a guest on Moody Radio’s ‘Midday Connection.’ (More on Moody Radio and Midday Connection in an upcoming post later on this year –Lord willing). 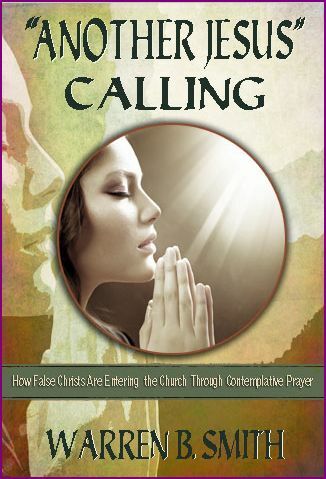 And, by seeing Margaret Feinberg as well as the previously mentioned names, it led me to one highly probable conclusion on what they all seem to have in common which links them all together –Spiritual Formation, mysticism, Contemplative Prayer, Emerging/Emergent Church; these are all unbiblical forms of prayer and spirituality that are leading many Christians astray! 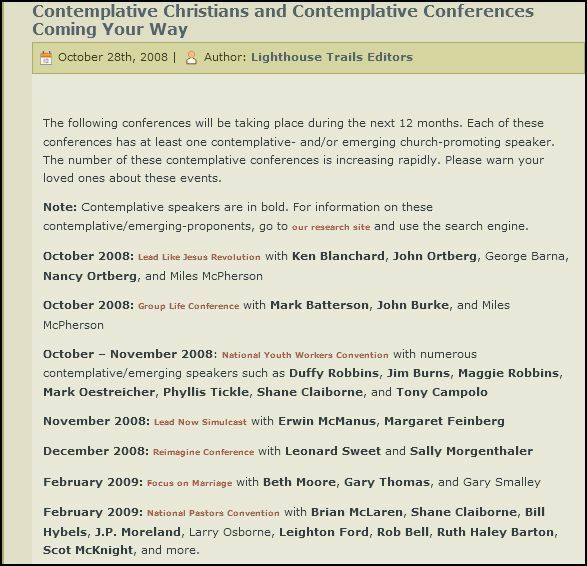 Lord willing, if time allows I’ll do research on the people that I am not familiar with to see if they are also involved with promoting Contemplative Prayer, Spiritual Formation, etc., and I will update this post so that I can share my findings with you. This concerns his ‘EVERYTHING MUST CHANGE’ conference, as well as his book of the same title, which will show you just how far from Biblical truth his beliefs really are! 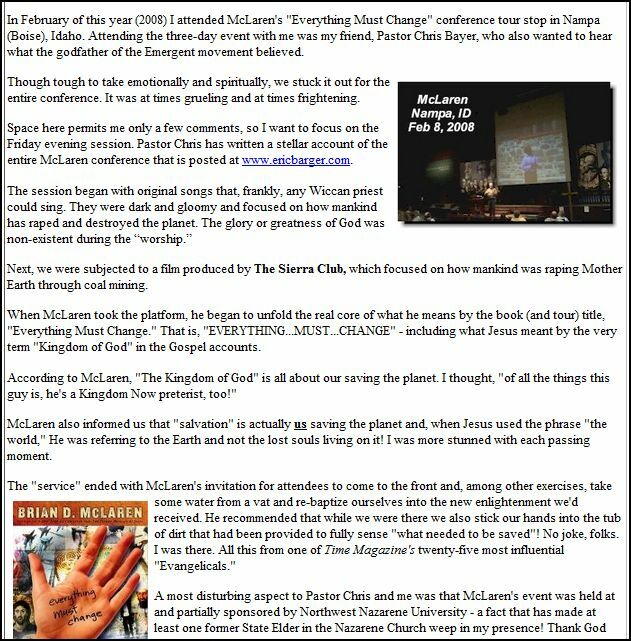 Seven years ago I heard Eric Barger share the shocking things that he witnessed take place during Brian McLaren’s ‘Everthing Must Change’ Conference. Eric Barger goes into greater detail concerning what happened at this conference in the video below than you will read in the information I quick captured for you further down. When time allows, please listen. Keep in mind that Brian McLaren is a frequent speaker at Willowcreek Church in Barrington, Illinois, as well as a speaker at many other Christian churches, universities, and conferences. 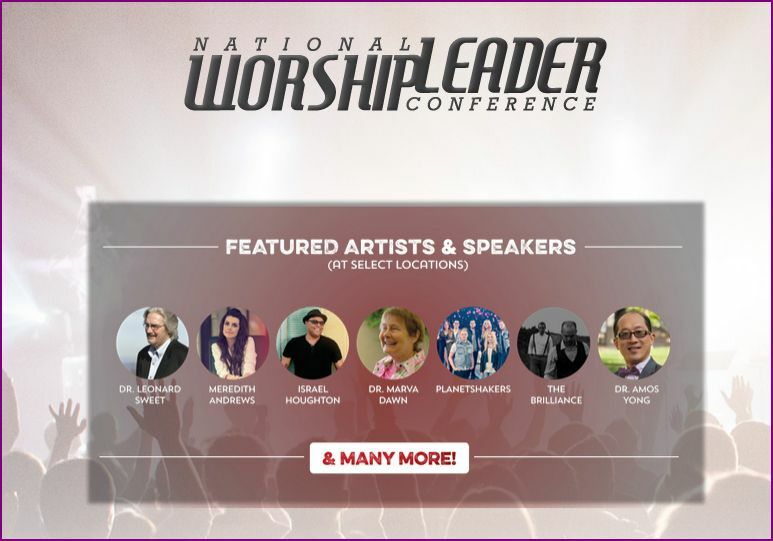 After you hear some of the things that took place at this conference, you will come to realize just how great the need is for discernment, and how important it is to study and truly know God’s Word so that we will not be deceived by teachers such as Brian McLaren! Please pray for him, as well as the many who are involved in this Emergent Church movement, that they would come to the knowledge of the truth and stop compromising and twisting what God declares to be right and wrong in His Word. In the following Playlist you will hear a three part message in which Brian McLaren will use Deconstructionism in an attempt to justify changing Christianity into something entirely different. Notice how Brian McLaren begins by saying how everything changes over time and uses maps as an example. He sets people up to accept his idea about how the landscape is changing and maps need to change and be updated because “they don’t reflect reality any more.” He then uses that concept to try and lead people to accept how Christianity must also change to adapt to a changing culture. Listen very carefully to all that he says, pray for discernment, and test what He says in light of Scripture. (In this Playlist I also added ‘A Critique of Brian McLaren’s ‘A New Kind of Christianity,’ as well as the video that I posted earlier concerning what occurred at Brian McLaren’s ‘Everything Must Change’ Conference). THE SECOND GREAT EVANGELICAL MELTDOWN – THE FALSE PICTURE – UNMASKING “POSTMODERNISM” – BY RICHARD NATHAN, M.A. I hope that you are now beginning to see how very important it is to test the teachings of everyone you listen to in light of Scripture, as well as the need to pray for discernment and to be aware of the spiritually deceptive practices that are leading so many Christians astray. Sadly, as many of us now realize, we live at a time where not all of us can trust our pastors or other Christian leaders because of the direction that many of them seem to be going in. 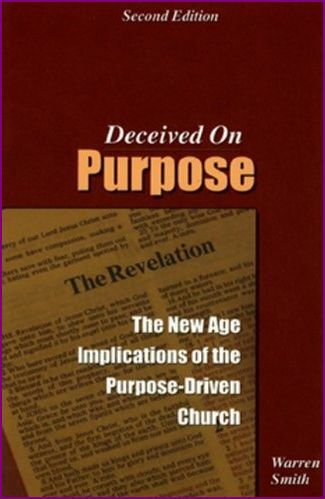 Some pastors no longer believe in the inerrancy of Scripture, many are compromising with Biblical truth, some are embracing heretics, some are promoting Contemplative, mystical experiences, and there have even been some Christians very recently who have brought complete shame to the name of Jesus Christ by their lives or by denying their faith completely. While there is still hope and forgiveness if they repent and turn to Jesus Christ with all of their hearts, as Christians we must learn that the only one who we must truly place our trust in is Jesus Christ Himself; we cannot rely on any man or ministry to learn truth. God’s Holy Spirit will be faithful to reveal the truth to us as we dig deeply into His Word to study it so that we can rightly divide the Word of truth for ourselves. NOTE: A special thank you to those of you who take the time to make a comment. Whether it’s to encourage or to share helpful information, or even if it’s a comment that expresses your disagreement with what I write, or possibly even a comment that is negative or harsh in some way. All of you motivate me to dig deeper, and I end up finding even more information that I would never have found if it wasn’t for those of you who cause me to search deeper for one reason or another. 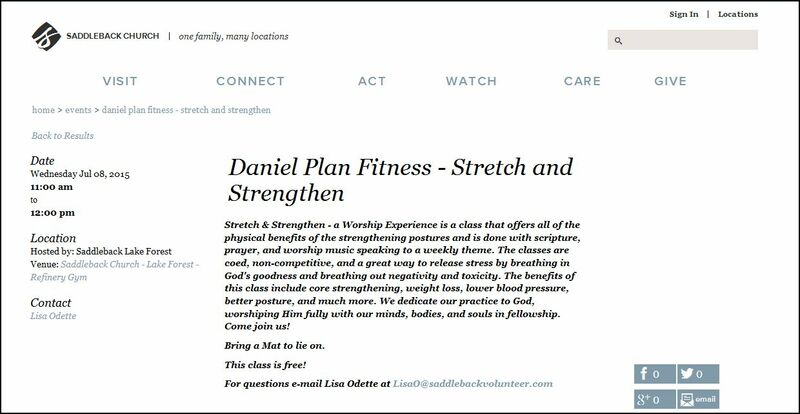 For this post, I want to personally thank Cindy Lopez for offering advice on what I could do to find more information on the instructor of the Stretch and Strengthen classes being offered at Saddleback in order to possibly verify if the classes offered at Saddleback are Yoga classes as they appear to be. I was trying to finish up this post by just focusing on finding and adding more information on Leonard Sweet, and wasn’t even intending to search for any further information concerning the classes. However, because of Cindy, I decided to continue on with my search on the instructors of these classes which led me to find, and already post, enough information that I believe will clearly put an end to any doubts that anyone might have –the information that I found concerning the instructor of some of these classes gives enough evidence to demonstrate that the Stretch and Strengthen classes are indeed Yoga classes! 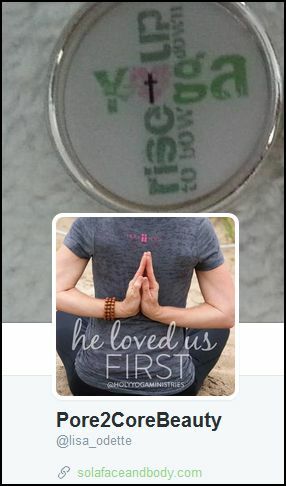 Lord willing, I will be addressing the dangers of Yoga in an upcoming post, since it seems that there are many Christians and other people who are not aware of the dangers of it, but I have other posts that I need to write first. Until then, if you are not aware of the dangers of Yoga, when time allows, please watch the video below in which Ray Yungen shares a lot of information on the dangers of Yoga. VISIT THESE WEBSITES WHERE YOU CAN READ MANY ARTICLES TO KEEP YOU INFORMED ON WHAT YOU NEED TO BE AWARE OF (These are my favorite websites). Lord willing, here are some of the books that I will be doing reviews on, and I also highly recommend them to you as books to read in order to become informed concerning how New Age mysticism is coming into many churches these days. Please send me your requests on what other books you would like to see reviews on. UPDATED 7/25/15 8:50 p.m. Added more information on Brian McLaren. 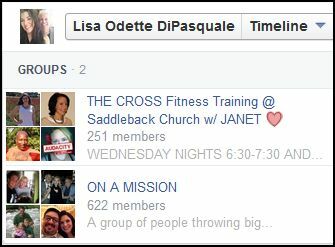 UPDATED 7/24/15 5:55 p.m. Added information that gives enough evidence to say with certainty that the Stretch and Strengthen classes offered at Saddleback Church is indeed Yoga. 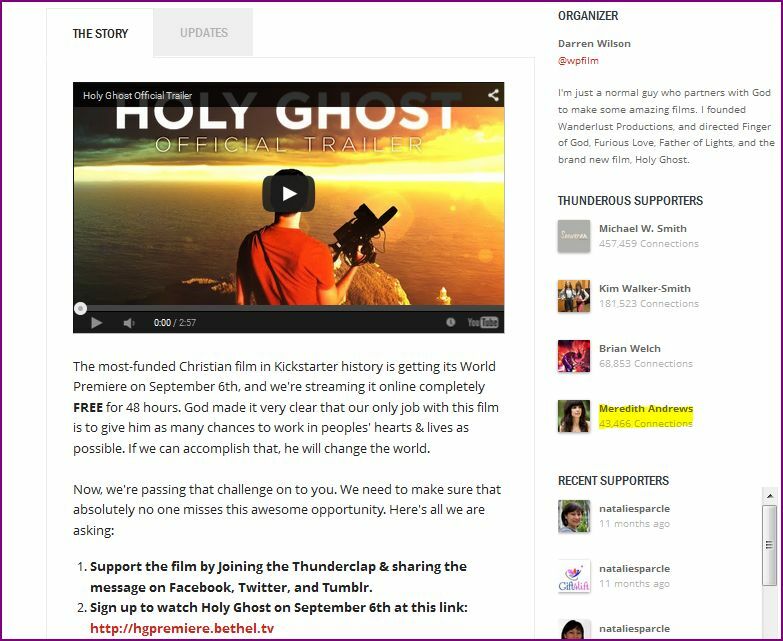 UPDATED 7/24/15 9:56 a.m. Added more information concerning Leonard Sweet and his ‘Everything Must Change’ conference and what Eric Barger personally heard him say. UPDATED: 7/23/15 10:53 p.m. Added more information concerning Leonard Sweet’s ‘ADVANCE,’ as well as information on some of the speakers participating with it, such as Brian McLaren and Margaret Feinberg. UPDATED MONDAY 7/20/15 9:43 a.m. Added videos concerning Leonard Sweet and his unbiblical teachings.